V 1-3 tell me that god sent an angel to bring prophesy to John. This prophesy is about the end-times, which John believes are near. And so John will report everything he ‘sees’. Yeah, I bet. I feel like I just slipped down the rabbit hole. V 4-8 John is writing to the 7 churches in Asia all about his ‘visions’. He sends greetings from himself, the 7 spirits of god (WTF? 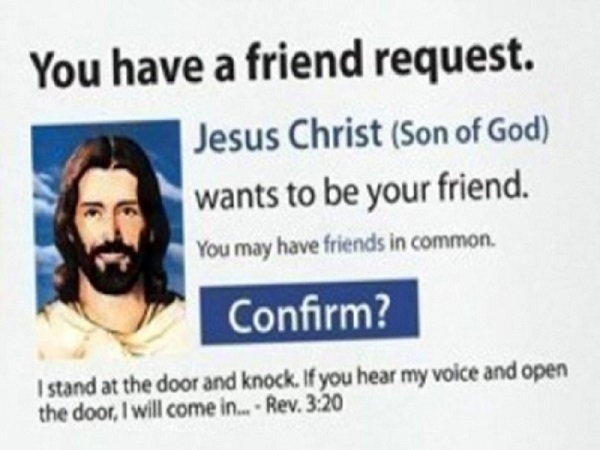 ), and Jesus. 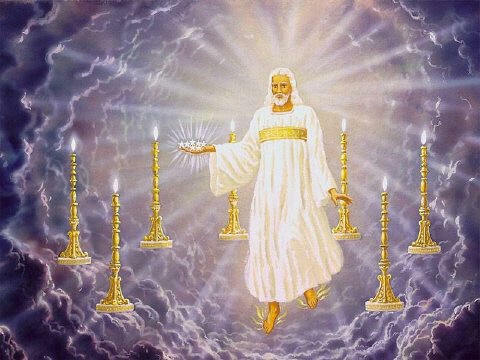 John seems to anticipate that Jesus will descend from the clouds (just like the vision in Daniel 7:13); and everyone will see him (not unless the earth is flat! ); and mourn him (just like in Zechariah 12:10). (I’m getting the feeling that maybe John has been studying too many OT prophesies, and he’s starting to dream about them.) And then Jesus makes more grandiose claims about himself – Alpha/Omega, etc. Nothing new there – if you’ve already read ‘I am the way, the truth and the life’ (John 14:6), you’re used to his boasting. In v 9-11 John describes how he was told to write about his visions to the 7 churches in Asia (part of what is now Turkey, not the continent), and then he lists their names. A bunch of obscure places. Anyway, he says he was praying when this happened; I wonder if he was fasting, or in some kind of trance, or maybe smoking a peace pipe, or if he just got a bit too much sun? 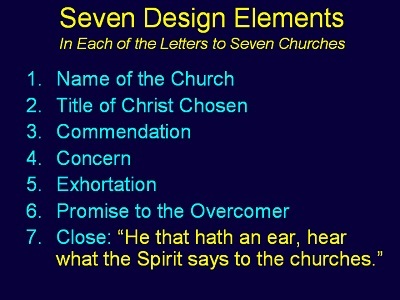 I’ll cover these chapters together because they constitute a series of messages from John to each of the 7 churches. The format of each letter follows a pattern. 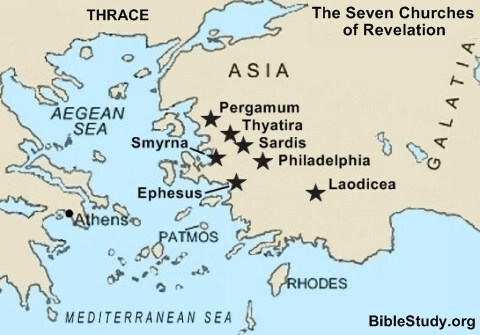 Ephesus (2:1-7): V 1 John says the message is from the guy with the stars and lampstands, so that’d be Jesus. Why doesn’t he just say so? V 2-6 John gives the church its ‘report card’. On the plus side – the people there are patient, hard workers, don’t put up with crap, rout out false preachers, and hate Nicolaitans just as much as John does. Minuses – they don’t love each other or work as hard as they did at first. If they don’t get their act together, John threatens to remove their lampstand; I’m assuming that’s a symbolic way of saying he will remove them from the list of 7 churches. (A note about Nicolaitans: they were a sect led by a deacon named Nicolas and considered heretical by the early church. Their exact heresy was uncertain. It is commonly thought to have been antinomianism – the belief that because one is saved by faith alone, morality is unnecessary and ‘anything goes’ because all will be forgiven. I didn’t know that had a name! But it might also have been polygamy, or eating food that had been offered to idols.) V 7 – an admonition to heed the words of the spirit because the prize at the end will be fruit from the tree of life; I assume that refers to eternal life. Smyrna (2:8-11): V 8 John says that this message is from the first/last dead/alive guy. Is John going to find a different cryptic/poetic way to describe Jesus in each of these 7 messages? (yes – yes, he is) V 9-10 John says he knows about the people’s suffering and poverty but they are rich. He doesn’t define rich – is he talking about something spiritual? Then he says he knows the church is facing opposition from a group who claim to be Jewish but belong to Satan. He doesn’t explain that remark either. Then we’re back to glorifying and justifying suffering – if they can just hang in there and ‘take it’, they will get a ‘crown of life’ (some sort of spiritual reward). V 11 The same admonition that the Ephesians got – listen to the spirit to avoid the ‘second death’. I’ll assume that’s another oblique reference to eternal life. So in Numbers, all we are told about Balaam is that he led the Israelites into some kind of unnamed sin. In Revelation, John mentions food offered to idols and ‘sexual sins’ (fornication) – where did John get that from? It’s not in the OT. Next we are told that the Nicolaitans follow that same teaching – which jives with the info I found about the Nicolaitans. So the church better repent, or Jesus will come at them with his double-edged sword (v 16). V 17 The same admonition to listen to Jesus, and the reward this time is manna from heaven and a stone with a secret message. Thyatira (2:18-29): V 18 This time the message comes from Jesus, the guy with eyes like flames and feet of bronze. V 19 These folks got a few things right – love, patience, service, endurance. V 20-25 Here comes the ugly. The people of Thyatira allow an evil woman to lead believers astray (notice how women in the bible always fill the role of temptress or witch?). And the punishments Jesus vows to inflict on her in v 22-23 sound like they came from the pages of a Stephen King novel. Sardis (3:1-6): V 1 In this message, Jesus is the guy with 7 spirits and 7 stars. V 2-3 Sounds like Jesus finds this church a little lack-lustre. He doesn’t say that they have done anything major wrong, more just like they have lost their enthusiasm and need to hold a pep rally. V 4-5 The reward for those who do not sin will be to wear white and walk with Jesus, and have assurance that their names will be in the Book of Life. I had to look that up: In Judaism and Christianity, this is the book in which God records the names of every person who is destined for Heaven or the World to Come. According to the Talmud it is open on Rosh Hashanah, as is its analog for the wicked, the Book of the Dead. Creepy! Sounds like the stuff of nightmares – can you imagine teaching this to a child? V 6 The same admonition to listen. Laodicea (3:13-22): V 13 Now Jesus calls himself the Amen (is that like the Dernier Cri? ), and the beginning of god’s creation. V 15-19 Another church that seems to have lost its enthusiasm. Jesus describes it as ‘lukewarm’ and ‘indifferent’. But in v 17-18, although they are confusing, it seems to me that Jesus is telling the people that there is something wrong with them, when they don’t think themselves that there is anything wrong – and then he is trying to sell them on a remedy for a non-existent deficiency. Anyone have a different interpretation? V 20-22 The usual advice about listening, and reward in this case will be dinner with Jesus, plus a chance for the lucky winner to sit on the throne with him and his father. Steve Wells, in the SAB, asks – if all 3 sit on it together, who will end up on the bottom. Bahaha! You should recognize v 20. Who knew it came from the bible?